Attractive ceramic mugs. Dishwasher and microwave safe. Choose from givitup's designs or email your own graphic, text or photos for a custom product. 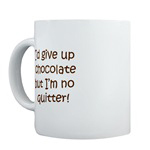 Click on 'search by product' at www.givitup.com to see all mugs or visit the custom section to send your request. Learn More about the cookbook that started it all, now updated, revised and better than ever! We'll be happy to send you a Sample Recipe per Day for One Entire Month. No cost or obligation. Just tell us where to send them. With an espresso machine in your kitchen at home, you can make your own latte’s to enjoy for yourself- and to impress your dinner guests! Some people look at the price of a home espresso machine and change their minds, but if consider what you typically pay when you buy a latte at your local coffee shop, whether it is a mom and pop shop or a chain (like Dunkin’ Donuts), you’re spending anywhere from $2 to $4 for a latte! Your espresso machine will more than pay for itself in a short time of making your lattes from home. Having your own espresso machine means having the ability to make latte’s for much less than you spend on them when you go out. Plus you can enjoy them anytime- not just when you’re on the road. Also, lattes are a wonderful after dinner complement- particularly when you have guests over! The espresso machine will grind your espresso beans fresh for every cup, giving you the fresh taste latte lovers have come to recognize as an integral part of the latte. Depending on your particular brand of espresso machine, you’ll probably dispense about 7 grams of espresso into the handle. Once you’ve extracted the espresso shot into the provided espresso shot pot (usually stainless steel, with a pouring spout), you can start steaming your milk! The basic recipe is 1 to 2 ounces of espresso to 8 fluid ounces of milk. Put your milk into the frothing jug, and slide the entire container over the steam arm nozzle. Make sure you keep the nozzle as close to the bottom of the container as possible to avoid making a lot of foam out of your milk. Use a thermometer so you know when the milk reaches 160 degrees Fahrenheit. Now you are ready to pour your steamed milk into the serving cup. A glass latte cup will look the best, and really impress your friends! Pour the steamed milk into the glass, using a spoon to hold back most of the foam that forms on the top of the milk. Once you’ve filled your cup with the milk, allow some of the foam to lie on the top for a “professional coffee shop latte” look. Your final step to preparing a latte at home is to take your espresso shot and pour it slowly down the inside of the latte serving glass. Some of the espresso will mix with the milk at the bottom of the glass and some will layer itself in between the milk and foam. You’ll have cloudy areas and several different shades of “latte brown”, making for a wonderful presentation that rivals that of the best coffee house. Only you won’t be paying $4 a cup, and you can make it and drink it in your pajamas if you want to! If you really want to make the presentation impressive, place your guests’ lattes on a cute little serving tray, with a decorative plate of fancy cookies. Biscotti’s are typically served with lattes, but you can be creative and serve anything you like. Maybe you could make some tiramisu using your espresso to make it from scratch for dessert, and enjoy slices of tiramisu with your homemade lattes! Your guests will want to come for dinner all the time once they experience your after dinner lattes. © Darren Hester, Some Rights Reserved.